ICEC aims to build capability and capacity for cancer care by mentoring Associates in ICEC Centers, in resource-limited settings. An Associate is a leader (in concept the local “champion” or if part of a Center, possibly the Principal Investigator). Through education and training ICEC Experts assist Associates in collaborative investigation, that will help the global community improve cancer care outcomes. Participation in ICEC is by application, including required commitments and metrics, for accomplishment and progress. Progression to becoming a ‘Full Member’ requires passing an appropriate ‘Cooperative Group’ type site visit, based on the ability of the ICEC Associate and Center to conduct guideline and/ or protocol-based care, on established standards. This enables participation in global research, the type and topic to be determined by the Associate and Center. Participation in research begins early on, including biomarker studies, guideline-based training, and education and clinical trials. Metrics are critical for the implementation science aspect of ICEC, for measuring progress as well as to share information and methodologies with others. It is anticipated that upon achieving ‘Full Member’ status, many of the ICEC Centers will become regional Hubs, thereby geometrically expanding the reach of ICEC. 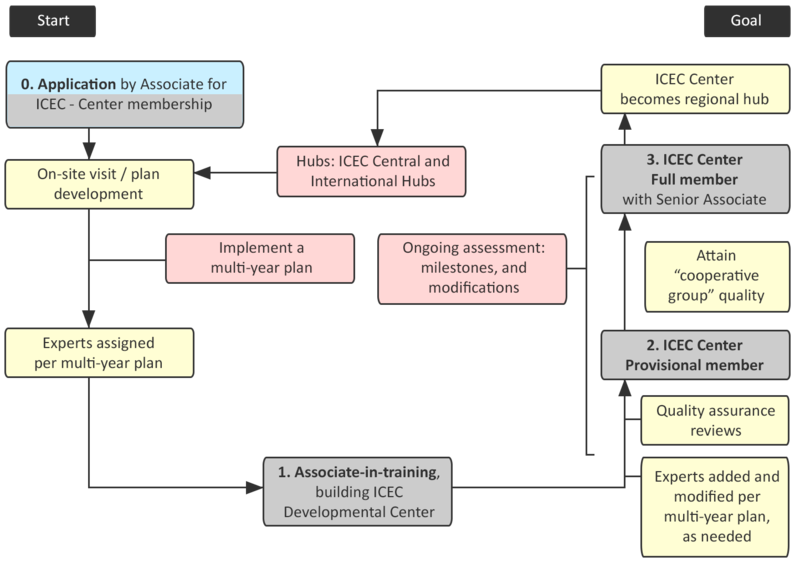 The chart below emphasizes that plans, programs and progress are based on collaboration and partnership, among the ICEC Associates/ICEC Centers and Experts coordinated through the Hub network.